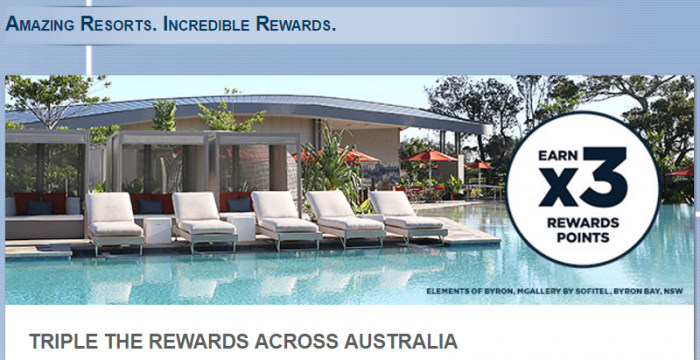 Le Club AccorHotels has launched a new triple points promotion for resort stays in Australia. Members must register for this promotion, make bookings between April 13 – May 31, and consume the stays April 13 – June 30, 2017. Note that the T&Cs refer to stays and bookings meaning that this offer is valid for multiple stays (sometimes they are are only valid for one). Not sure if this promotion is only valid for those that have their Le Club AccorHotels in Australia, because my personal account was not eligible. Good promotion for those that plan to stay at any of Accor’s resorts in Australia before the end of June. 1. General Le Club AccorHotels terms and conditions apply to the Australian Resorts X3 offer and you must be a Le Club AccorHotels member to benefit from it. 2. This offer entitles Le Club AccorHotels members, regardless of their membership status, to multiply by x3 their Rewards points for a stay in one of the participating resorts in the Le Club AccorHotels Loyalty program. This bonus of Rewards points is offered in addition to the Rewards points and Status points that are usually earned by the Le Club AccorHotels member for each eligible stay done in application to the Le Club Accorhotels General Conditions of Use. 5. This offer is valid for bookings made between 13 April and 31 May 2017 in one of the participating resorts in Australia for stays between 13 April and 30 June 2017. 6. The stay must be a minimum of one (1) night(s). 7. Any consecutive stays (check-out and check-in same day) in the same hotel, will be considered as a single stay. This single stay will be eligible once to the Australian Resorts X3 offer. 8. For the purpose of this offer, a stay is one (1) reservation made by a Le Club AccorHotels member for one or more rooms in a participating resort. For the avoidance of doubt, a reservation made for more than one room will therefore be considered as only one (1) stay. 9. To benefit from this offer, your booking must be made on AccorHotels.com, the AccorHotels App or participating brand websites and via AccorHotels Call Centres. All other reservation channels will not be eligible to this offer. 11. Le Club AccorHotels Rewards points are credited to the member’s account within 10 days following the end of the member’s stay. 13. Any stay partly or entirely paid with Le Club AccorHotels Rewards points or with one or more vouchers will not be eligible to receive this offer. Stays entirely or partly paid for with Le Club AccorHotels points, or with one or more vouchers will not count towards offers that require multiple stays for points earn. 15. Please specify the reference 49405 in all your communications with AccorHotels call centres or customers care services related to this offer. 16. You must register for the Australian Resorts X3 offer before proceeding to the booking, to be eligible for the offer. Next articleGuest Rant: Is Delta the Pepsi of Airlines?